I like to complicate things. My plans for Fashion's Night Out were all over the place just a couple weeks ago. I wanted to attend FNO in NYC, but scheduling was making that difficult for me. 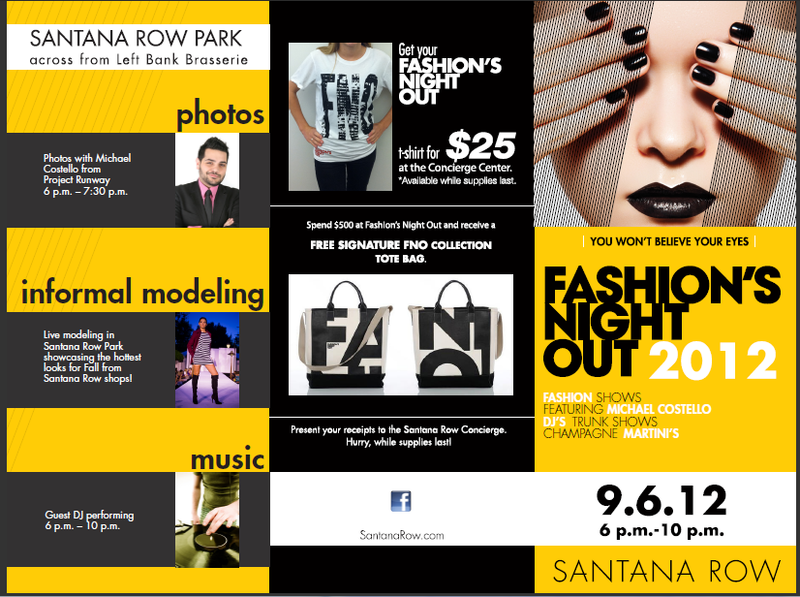 So I decided not to screw things up like last year (in which I was on a plane during FNO and ended up missing it in two states), and just attend my local Fashion's Night Out at Santana Row. Michael Costello from Project Runway made an appearance in a night filled with modeling on a catwalk, live music, complimentary drinks and snacks, and of course, shopping deals! ♥Cynthia Rowley sunnies ♥Charlotte Russe tuxedo blazer ♥Jason Wu for Target top ♥F21 belt ♥H&M trousers ♥Juicy Couture bag ♥Jeffrey Campbell spiked ankle strap burke city heels I met these two girls (and I just now realized they're wearing the same lace shorts) because they came up to me and asked where I got my shoes. I remembered to give them my blog card! Wow! Yet another photo of me. How about a look at the actual models on the two runways. They were modeling for Donald Pliner, H&M, Pink Stripes and more. There was also some fun fashion off the runways as well. I had to snap photos of these two girls--how could I not? Totally different looks, but both were so stylish. 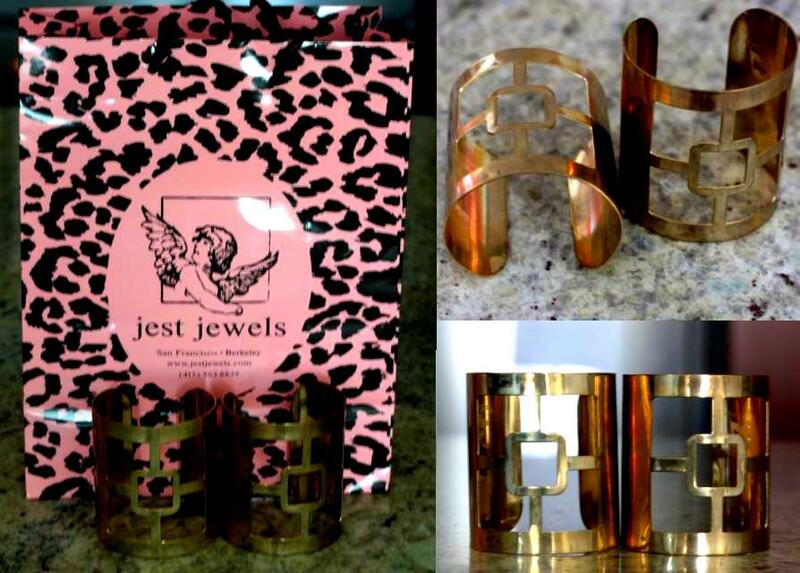 And last but not least, these fun and edgy cuffs from Jest Jewels. The people at the store kept telling me how nice I looked, so I felt like I had to buy something. But that was fine with me because they had the cutest baubles. Can't wait to wear these out some time soon! 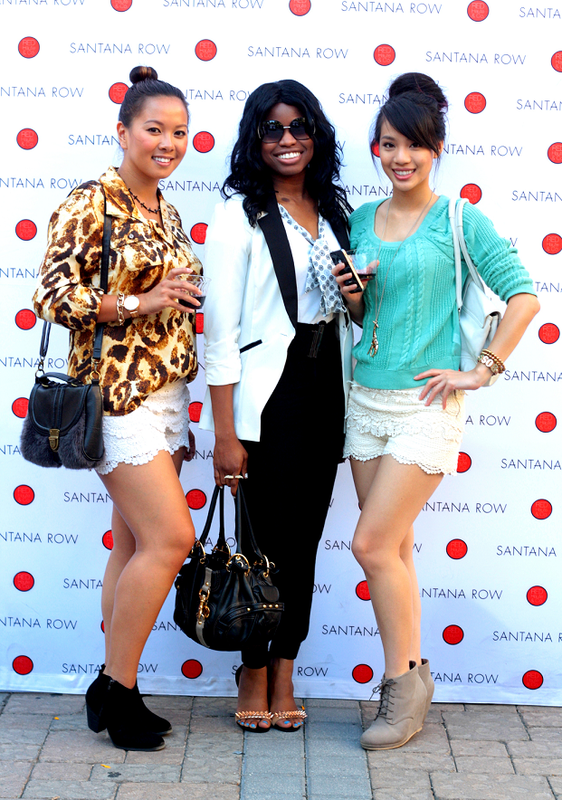 What did you do for Fashion's Night Out in your town? had no idea you lived in SJ! me too! You shoes are killing me - seriously, those studded straps are awesome! Love that jacket on you!!!! It looks like you still had a fun time! I love the two very different looks for the two attendees! Hi Cheryl, its so great that you have FNO events locally as well. You look uber chic, I haven't seen this masculine inspired look on you before, you are killing it hun! Lurv the heels! You looked fantastic (as usual)! I love those little rabbit ears on the 3 models haha, so cute. I wonder if I could pull them off... hmm. Those cuffs are amazing! I wish I could wear cuffs, but they never seem to work on me. you look amazing!!! Love your heels too. So awesome!!! ooh I love the white blazer you wore in here! looks awesome! Cute Cheryl! 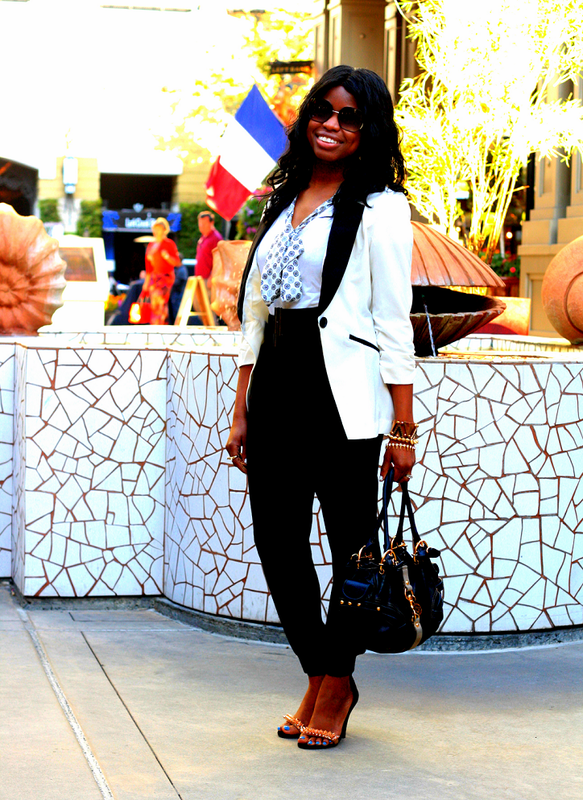 In love the tuxedo blazer! Remind me to get one, lol! Shoes are HOT!!! Looks like a nice event too! FUN! I love you 'fit. Those shoes, that pedi! So so cuuute! I love your tuxedo jacket and can't believe it is from Charlotte Russe! Looks like an amazing time you had! Looks like you had a great time. That beautiful tuxedo blazer is my favoruite! U look stunning as usual honey, love e whole outfit! Looks like a fun night Cheryl. 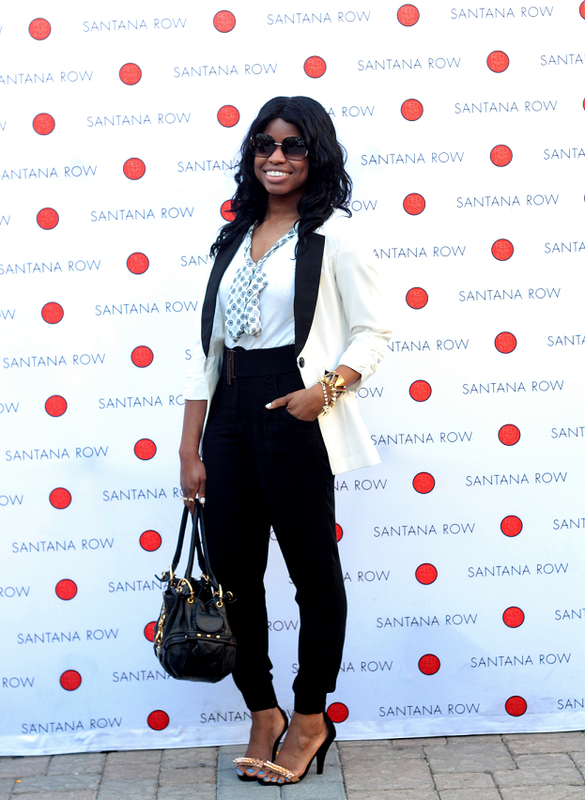 Love your outfit, especially that tuxedo blazer, just gorgeous! Rest assured -- I will steal that blazer from you. so hot, love ur blazers. Yeah, I love your shoes too, so chic! Looks like a really fabulous event. You look great as usual and it looks like you enjoyed your Fashion's Night Out. Unfortunately I didn't get to attend any events we had downtown in our city, work held me back. Although I'm sure it would of been the perfect event to photograph with all the neat boutiques we have. Love for crisp white jacket. You did look great! And love your blog cards!